Lots of cool looking gadgets can be bought online. Some of you probably get them from eBay too. However, there are not many out there who give a free shipping service to your purchase, even if the purchase is only worth $2. I recently stumbled on a site called Budget Gadgets and found my way browsing through the list of gadgets they provide. The site is of a simple design that provides easy access to the categories and also any information you need for shopping on their site. If you are tight on budget but would love to buy cool looking gadgets, you can also browse them by price. Shipping, as I mentioned, is free. If your purchase exceeds the amount of $200, your orders will be automatically upgraded to an EMS/DHL delivery service, complete with a tracking number. 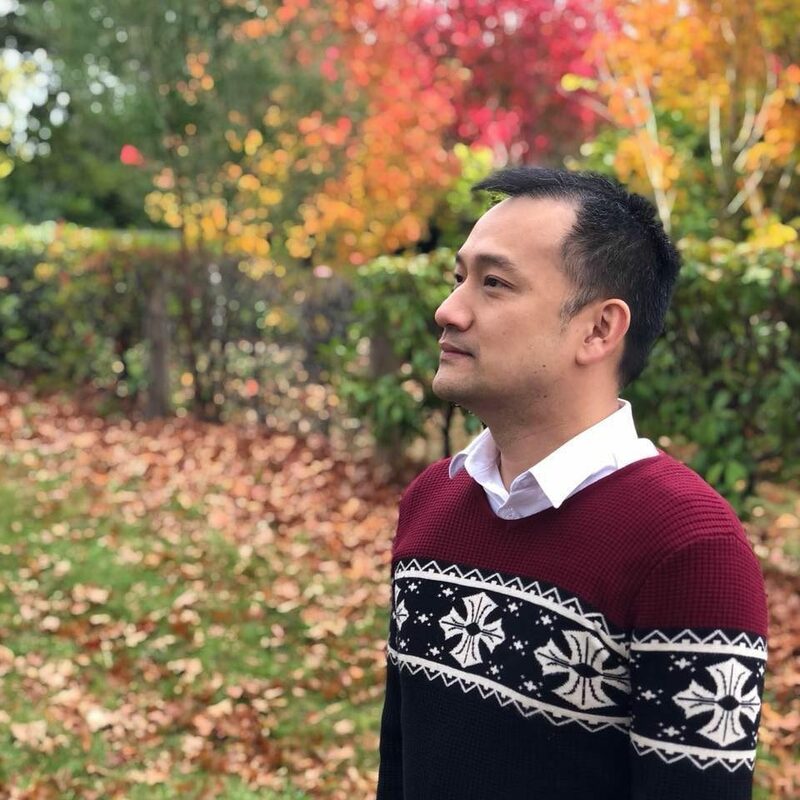 A standard shipping takes around 5-12 working days to arrive (my stuffs arrived in 7 business days, so I was quite happy with the service) and the express (EMS/DHL) will take around 3-5 working days. Honestly, this is probably the only time I’ve ever experienced a packaging so neatly & tightly done! 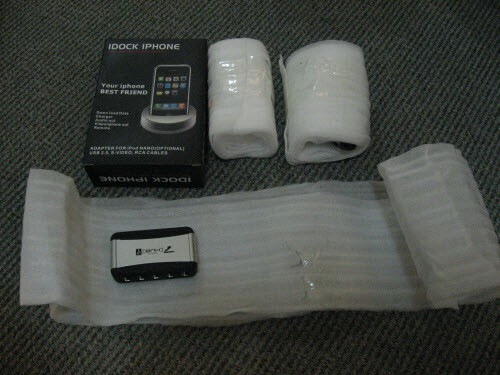 Even the cables (for the USB hub and iPod Nano docking station I ordered) were tightly wrapped and secured. I personally love the Computers and Electronic sections. There are literally hundreds of USB and computer gadgets there ready to be added to the shopping cart. Stuffs like USB card readers, USB hubs, and HDMI cables are easily the most popular items needed for every computer at home nowadays. If you just want to shop for something new, you can always browse the products by Price, which is a welcome addition on the site’s navigational. This way, I can buy an interesting $1-3 item to satisfy my shopping desire without feeling too guilty. The products are mostly of course, made in China. So don’t expect a grade A quality of product with that kind of price. However, the products I got are built nicely so I have no complaints here. 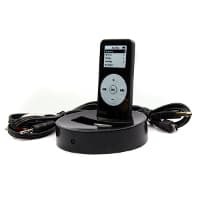 It is a universal dock that connects your iPod and/or iPhone to your home audio system. The dock can also be used to simply charge & sync your iPod/iPhone to your computer through the USB connection. If you don’t have a nice sound system, you can also plug it to those standard speakers on your computer. It worked great and no installation was necessary. There was also a remote included so you can control your iPod from a far while docked in it. Please note though that the docking system doesn’t work on my iPod 4th Generation, which I found weird. I would have thought that it has a similar connector just like its predecessors. The product description does say that it only works with iPhone and iPod touch/nano/classic/nano3. So no iPod nano4 (4th generation) was mentioned. The iPod Nano 3rd Generation works flawlessly (which I used to write this product’s mini review). The product doesn’t come with a manual but it’s all pretty much self-explanatory. A pretty much standard feature of a USB Hub. 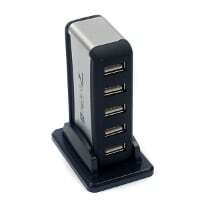 It has up to 7 USB ports so it can definitely fit all USB devices that you have at home. Since running 7 USB devices through a USB Hub is not entirely a good idea due to the power, this hub is actually self-powered (you can choose it to be powered via the USB port on your motherboard or self-powered through an electric wall socket). This is a very welcome addition and will make sure that your USB devices have plenty of power supplied to them, reducing damage and random disconnections. The Hub looks great and feels very sturdy. It has a quite bright blue LED but since it’s located behind the hub, the light shouldn’t distract you at all. Oh, have I mentioned that if you use the coupon code MM5OFF8 during your checkout, you’ll get a 5% discount off? :) It’s exclusive for my readers so feel free to use the coupon and spread this post around to your friends. The coupon applies to any order or any items that you bought on BudgetGadgets.com. Budget Gadgets sells good quality gadgets and best of all, they are priced cheaply. Not to mention that all of these are delivered free to your house without any minimum order rules. All items are also packaged safely and securely (based on the ones I’ve got). Since BudgetGadgets claim to test all items before they got shipped, the excellent packaging & handling is a big plus. If you have further questions on replacements, warranty, etc, you should be able to find your answers on their FAQ page. Budget Gadgets is not a scam site and it’s been proven. The site has a PageRank 3 and an Alexa Rank of 59k, meaning it has received good backlinks and also a good amount of traffic. Upon further investigation, the domain has also been registered since 2004 and has been extended until 2011 (when this post was written). I’m sure no scam site will be around that long. If you are still cautios, get a few dollars worth of item to test the site yourself. Next articleWindows 7 RC is finally here!